Britain’s managed pub and restaurant groups saw collective like-for-like sales edge up 0.6% in August, latest figures from the Coffer Peach Business Tracker show – with more mixed weather bringing better news for the country’s casual dining chains. Managed pubs saw collective like-for-likes grow 0.2% against August last year, while restaurant groups were up 1.4% for the month. “These latest figures will come as a huge relief for restaurant operators, who have been under the cosh of late, not least because of the early summer heatwave which was great news for Britain’s pubs as the public headed outdoors, but little help for the country’s restaurant chains,” said Karl Chessell, director at CGA, the business insight consultancy that produces the Tracker, in partnership with Coffer Groupand RSM. Regionally, London performed better than the rest of the country, with August like-for-like sales up 1.5% on the same period last year, while outside the M25 trading was up just 0.4%. Underlying like-for-like growth for the 47 companies in the Tracker cohort, which represents both large and small groups, was running at 0.5% for the 12 months to the end of August, the same as it was at the end of July. Total sales growth across the pub and restaurant cohort, which includes the effect of new openings, was 3.2% in August, reflecting a slowdown but not a halt in brand roll-outs, and was running at 3.7% for the 12 months to the end of the month. 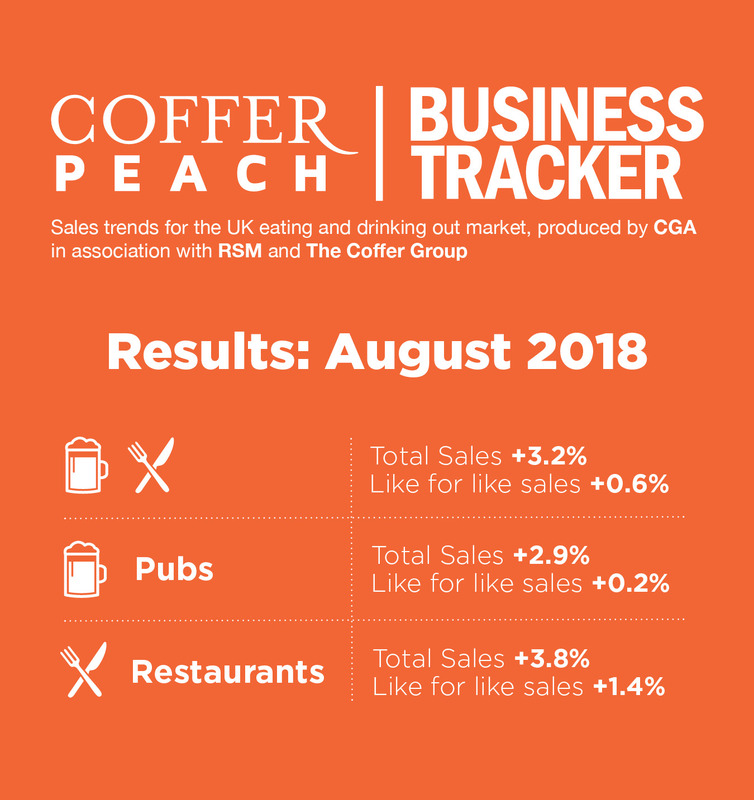 The Coffer Peach Tracker industry sales monitor for the UK pub, bar and restaurant sector collects and analyses performance data from 47 operating groups, with a combined turnover of over £9bn, and is the established industry benchmark. CGA Peach collects sales figures directly 47 leading companies. Participants include Mitchells & Butlers (owner of Harvester, Toby, Miller & Carter, All Bar One etc), Pizza Hut, Whitbread (Beefeater, Brewers Fayre, Table Table), Pizza Express, The Restaurant Group (Frankie & Bennys, Chiquitos, Brunning & Price), Spirit Group (Chef & Brewer, Flaming Grill, Fayre & Square), Casual Dining Group (Café Rouge, Bella Italia, Las Iguanas), Stonegate (Slug & Lettuce, Yates’, Walkabout), Deltic, TGI Fridays, Marston’s, Azzurri Restaurants (Zizzi, ASK), Wagamama, YO! Sushi, Prezzo, Novus (Tiger Tiger), Fuller’s, Carluccio’s, Young’s, Living Ventures, The Alchemist, Gusto, Strada, Amber Taverns, Hall & Woodhouse, Gaucho, Giraffe, Loungers, Byron, New World Trading Co, Peach Pub Co, Le Bistrot Pierre, Laine Pub Co, All Star Lanes, Le Pain Quotidien, Fazenda, Liberation Group, Wadworth, Honest Burgers, The Snug Bar, Downing LLP (investment partner of Antic London), Bermondsey Pub Company, Revolution Bars Group, Polpo, McMullen & Sons, Coaching Inns Group, Rileys Sports Bars.